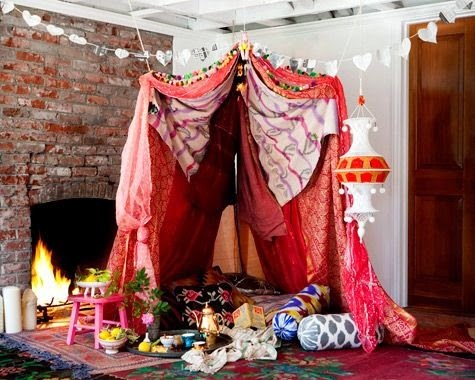 Second Anniversary Cotton Inspiration- Let's Build a Fort! Even though cotton makes for some super lame gift ideas, it has to have one of the most awesome decorating ideas front and center. 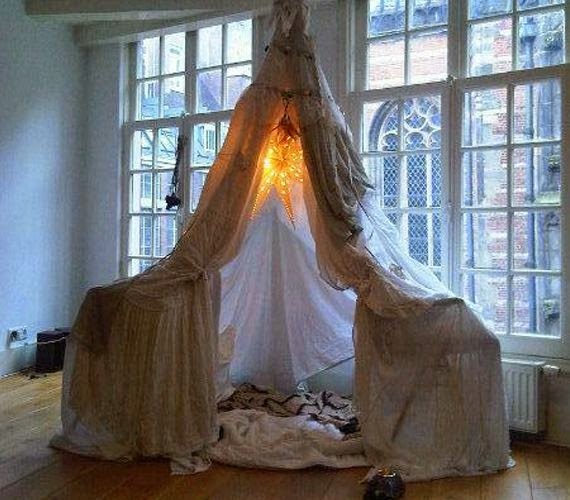 People, we are building a tent out of sheets. Just move in for a weekend and that is a pretty awesome memory. I am thinking maybe you can even eat dinner in the tent if you can think of something that isn't too messy. I think one of the best things about this idea is that you can use what you already own. Take your own flat sheets and see what you can come up with. Add some Christmas lights, blankets, and pillows, and you have an amazing memory that cost you 0 dollars (and is completely eco-friendly!) 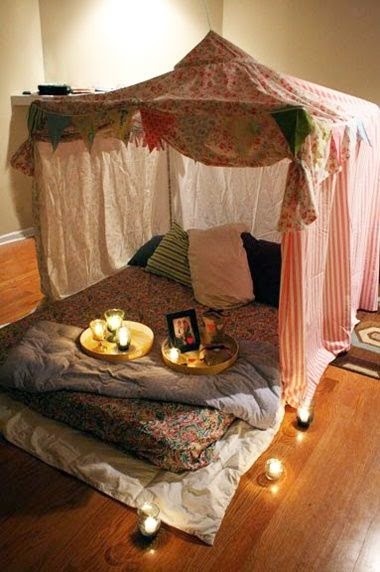 No matter what, I am just pumped for this idea- have any grown-up readers made a tent or fort inside their house? Any tips for making it awesome? First of all, where is this? Is that church outside the tent? This one seems to have some real engineering behind it, but it does look really chic. 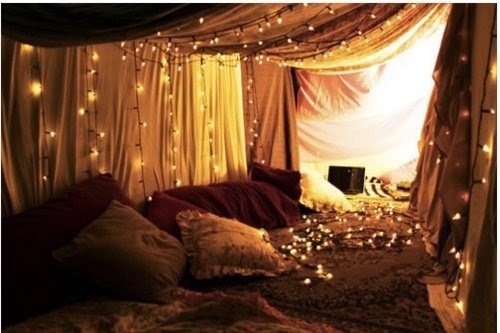 I do like the ones using light colored sheets and with lots of lights, because it takes something childish and makes it seem somewhat sophisticated. That being said, using what you have is the best way to throw an amazing anniversary. I love this one. It looks like they live in it full time, which I support. 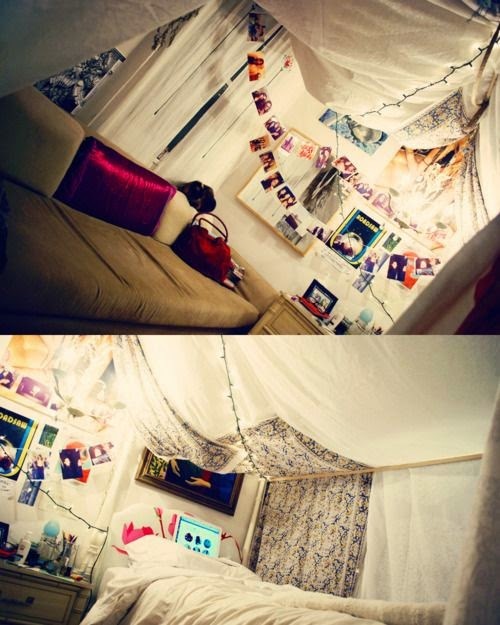 I also love the hanging pictures, so I think I am going to get pictures printed from our second year to decorate inside the tents. This one is amazing. I cannot step to this, though I am slightly concerned about the closeness to the fire. I love the combinations of patterns and colors. If you wanted to add more color or patterns to yours, think about checking some thrift store sheet sections- they have good stuff! But please, if you want a fire by the tent, at least turn it all so you can see it. The lights take everything to another level, so I bought these kind of cotton puff looking lights to hang with the white lights we have used for other things. When we had our second anniversary, I pulled ours together around the square frame of our bed, fastened together with sandwich clips. It worked pretty well, and the whole thing stayed together. Let me know how it works for you?